See Vol. III, No. 1 of Gardner's Beacon for a continued look at the legacy of Thomas and Margaret () Gardner using an Annals format. This time the focus is on the period prior to the arrival in 1623/24, for the most part considering the context and motivations of the arrival. Future looks will be at the Dorchester Company and then at Thomas and Margaret, specifically. The best known immigration event in the U.S., to many, is that of the Pilgrims and their Mayflower voyage. Too, Jamestown got recent recognition with the 400th anniversary of the settlement's start. In both of these attempts, the people involved endured a lot of hardship and suffering. It took years to become what might be considered successful. We, across the distance of time, can easily ignore the troubles and look at the accumulated glory. After all, the majority of U.S. educated people can tell us the stories behind the first Thanksgiving, even if some of the details may be a little off the mark. The fact is that New England, which was North Virginia, did not offer an easy time for any early settlement attempt. We will look at some of these over a fifty year period. Aside: The original intent was to cover +/- fifty, but there is just too much information for that. So, we'll continue with this theme for awhile in the Beacon. Some of the views will cover a wide expanse of time while others are expected to zoom in on a particular period or series of events. There were many changes going on in England and the world. The image depicts changes on the throne for the period that would cover the life of Thomas and two generations before. 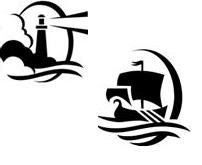 Comparatively, though it has been couched, by many, as being otherwise, the Cape Ann venture, led by Thomas Gardner, was successful in several ways. For one, those there made it through the winter. Then, they established themselves, built a great house, put up other dwellings, made plantings, and more. They were healthy enough to be rambunctious when relating to those who may have wanted to encroach (to wit, Roger Conant's peacemaking role). And, they did go on to found Salem. In fact, when Winthrop showed up in 1630, he feasted on strawberries from Cape Ann. Most likely, these had been cultivated. He also was wined (or beer'd) and dined in a house (see Wikipedia) that was the first of its type in New England. Be that as it may, to understand the origins, we need to look at those earlier times of exploration and of trial residence that went on for several decades. This look is not conclusive; to be comprehensive is beyond the scope of any Beacon issue. There is an intent to fund necessary research to fill in gaps about the lives of Thomas and Margaret including looks at the contexts, situations, and collateral families. 03/18/2014 -- More thoughts on Cape Ann, Thomas and Margaret, and, not least, strawberries. 03/23/2013 -- Beacon issue, Vol. III, No. I, is available. 1st Edition still there in PDF format. This issue looks at events prior to the arrival. Looking at the arrival and early times in more detail makes it even a stronger thought that the group was overlooked and denigrated. That statement is not meant only in relation to Thomas. The whole group had their position in history lost. We'll re-look at all that has been said and reconstruct, as needed, a view that ought to be left for future historians to discuss. 03/21/2013 -- 1st edition (or draft) migrated in order to get all the pieces into place. The completion of edits will be noted by the removal of the watermark. We brushed upon origins a few times: Historical genealogy, How many wives?, and Black death.The first post of this blog asked about the ancestry of Thomas and Margaret. As mentioned in the last post, we are looking at different periods that relate to lives of Thomas and Margaret. And the period right around the arrival (+/- 50 years) is a current focus. And, motivation for leaving is always a concern. This post looks at an issue that culminated around the time of Thomas' great-grandfather. The influence from the particular conflict was deep. In fact, about that time, over a century of conflict came to an end. Of course, after the peace, turmoil continued which we'll get into. For now, let's consider the case of the bickering cousins. In a sense, all the conflicts on UK (and related areas on the continent) soil were of this type. However, this one had very close cousins at each other's throat (extreme sibling rivalry -- gosh, are we any better today?). So, it was a blood war, but not between rival clans. No, it was cousins vs cousins. There is not any reason to see this as unusual, as we'll also look at many conflicts between brothers before we're done. Aside: In looking at origins, this particular topic is important but is not the only one. We're starting with it due to entanglements. I don't know just how much we appreciate the reality on this side of the pond. That gaming has taken up the theme, partly encouraged by the Game of Thrones series (I liked the first two books; am not a gaming type; haven't seen any of the TV stuff), may tell something. Go to Google (or Bing), and look at War of Roses (images) and note the gaming interest. 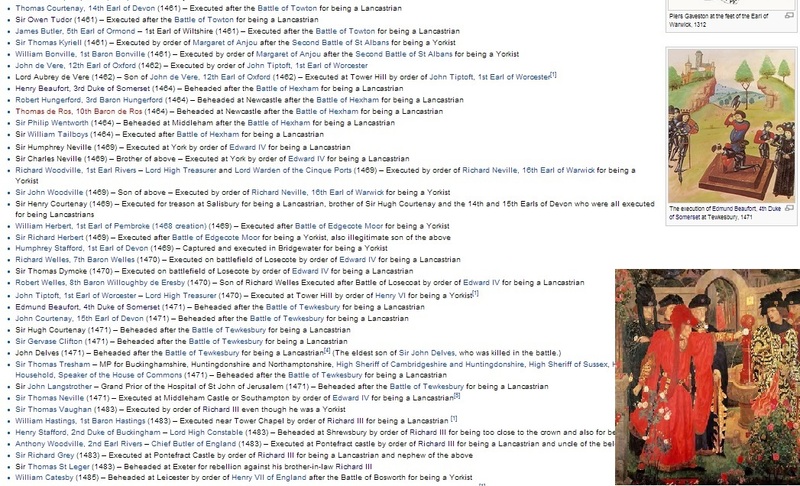 So, this image has a list of people who were beheaded during the period of the War of the Roses. It's not a short list, by any means (see the Wikipedia page). The two images on the side are the following: Choosing of the roses (below) and The execution of Edmund Beaufort, 4th Duke of Somerset (above). Edmund is in both of these paintings. He's on the right of the Choosing scene and the main character in the other. But, this is only a list of the noble class victims. There were many other casualties, such as the Two Princes. Too, what was the havoc wrought upon the general populace, of all of the classes? This is one little example. Does England look to be a pleasant place to be? One can appreciate the dreams of freedom that pushed people off its shores, even if these were illusory at the time (did you know that there were early hippies - Merry mount). Yet, there was a less oppressive nature in group that came with Thomas and Margaret than later (of course, about now, we need to mention that Plymouth's involvement will be covered, to boot). It was not long before a hammer was sent over (another whole story). One can also understand the appeal of the Quaker point of view which figured heavily in Thomas' later life through the influence of his last wife and in the lives of some of the progeny. So, we've barely kicked off a look at origins with a brief touch on motivations. As said before, whatever the motive, Thomas came here, raised a family thereby leaving a legacy, supported the founding of the civilization that became the U.S., and has tales to tell about his life and character. It is for us to discover these and preserve them for posterity. 02/12/2014 -- The motivations theme will arise, recurrently, as we look at telling the stories. 03/31/2013 -- The recent Gardner's Beacon issue looks at priors. On the War of Roses, not only were the participants blood relatives, they were Christian, ostensibly. So, an Easter thought is in order: was not their behavior as far from what Christ would have wanted as was possible? Then, again, how close to such an ideal was the Crusader behavior of their ancestors? We have had two posts dealing with descendants: The kids (Sept 2010) and Two generations (Oct 2010). Both of these posts used material from the work of individuals who have taken the time to post on rootsweb which has been around awhile. There are other sites, to boot. One can use these build composite trees. Bevan's work is an example. He has merged multiple lines from the work of others. But, he does not have Thomas and Margaret. Now, taking the work at rootsweb, a query on Thomas who died in 1674 brings up 822 trees (822 at the time of the original post; today (7/19/18) it's 966). Of those 822, 722 have Margaret as wife. But, and here is the catch, of the 722, only 255 have sources. Following along with D.A.R. and the Hereditary Society Community (HSC), we ought to require sources. At the same time, we ought to allow expansions of a tree that are conjectural. A lot of this rootsweb work may have been done by Thomas descendants. Many others may have been done by people looking at collateral families. Or, someone may have included the Gardners just to be complete. How much of it is believable? One task might be to take Dr. Frank's numbering and then extend it to about three or four generations. Or, we could pick a time, say 1812, as the end of a span. So, two basic issues are the technical aspects and verification. The former ought to leverage upon work that has been done on the computer for the past few decades. The latter may be more problematic. In any case, one basic notion is to fund research on a continuing basis in a manner that persists across future generations. To accomplish that, it would be nice to have a reasonable starting point. Lots to look at and do. So, a slow build via incremental means has been the focus so far. As suggested by the Backbone category, there are many lessons to learn of a varied nature that is not small in breadth. One focus of late has been looking back across the pond, mainly to get acquainted with things. Hence, the focus of the next Beacon will be along that line, albeit in a brief fashion. Many see posts almost like twits (tweets?) which have a small temporal footstep. We could see them as something that, at some point, could be pulled into a book. Of course, to do such a thing right would require major editing, but that is part of the work (editors exist for that purpose). The content would be there, though, which is the key. Too, there are several ways to communicate. Mass e-mailing will be limited. Annoucements will be by the TGS site and the TGS Forum. Right now, the TGS Forum is using a blackboard approach. Just like with the blog, there are several ways to support discussions. It would be good settle on a method that is effective with which to carry forward. 03/02/2013 -- What's New at the TGS site will post things of interest. The main page will provide the last change date for the What's New page. 03/04/2013 -- Forgot to put the pointer to rootsweb. Today, there were 821 trees to this query: Surname (gardner), Given name (thomas), Death year (1674). Now, a slight change to the Death year of +/- 5 years increased the count to 897. If the TGS was going to be effectively used for this type of database entry, it would be by providing a place where one could get the facts, as they are best known. At this point, doing such a thing would require technical support as well as continuing scholarly work of a sponsored nature. Also, identify the Hereditary Society Community properly. 07/19/2018 -- Changed the rootsweb link. It was out for a few months and is slowly coming back. Which ought to motivate thoughts about continuity. In 2017, we put in a new site (which will work with the original one): TGSoc.org. Also, our main theme will be: Culture, history and technology (of which we will find genealogy, genetics, and a lot more). With the last Beacon, we started an "annals" approach which will be useful for awhile. The next issue will follow the same format, looking at a period of time that covers 50 years on either side (so, we're talking a span of 100 years) of the arrival of 1623 or 1624. Most, such as the Great Migration Project, have used the latter, however there was a party left here to overwinter in the fall of 1623. Was Thomas with that crew? We'll have to collect the facts and opinions about that event. Also, the whole general framework in (and from) which Thomas and Margaret lived (and left) will be of interest and will involve a lot of material, as we know from looking at history. 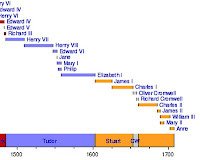 Things to consider would be several: early looks over here (such as Florida, Maine, Virginia and places in-between), what was going on in England (how many transitions of power were there in that span? see image - with a normalized view, one would think about 4 or 5), the goings-on related to Rev. John White's Dorchester Company, and, of course, the family of Thomas and Margaret. We started to list some of the 400th anniversaries that have occurred or will occur (thinking about preparation). Too, we can look forward to this year being the 500th of the founding of Florida. Post-note: At some point, we plan to have a database that will be compatible with the current formats for genealogical data. In the meantime, we can have (develop) a web-based look at Gardners in the context of the unfolding of the past four hundred years or so. 03/02/2013 -- See a few considerations. 12/29/2018 -- We started to look at WikiTree (using Dr. Frank's tree). We have printed four volumes of The Gardner Annals (I, II, III and IV).